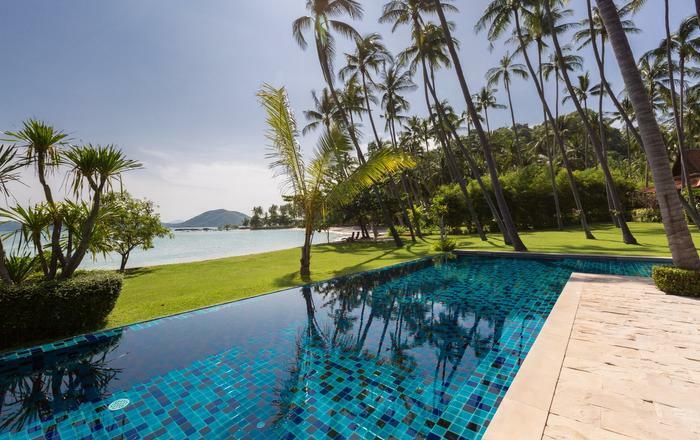 Ban Haad Sai, meaning 'The House on the Beach', is a large luxurious beachfront villa made up of spacious and airy living pavilions and lush expansive tropical gardens. 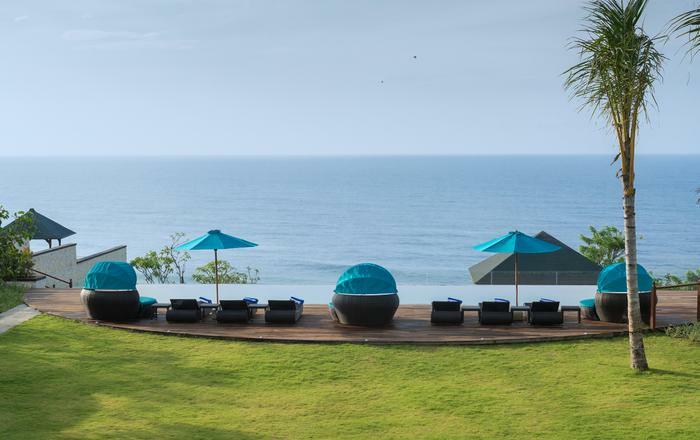 Topped off with spectacular sea views overlooking the truly inspiring Big Buddha Bay and its famous Temple, the Big Buddha. 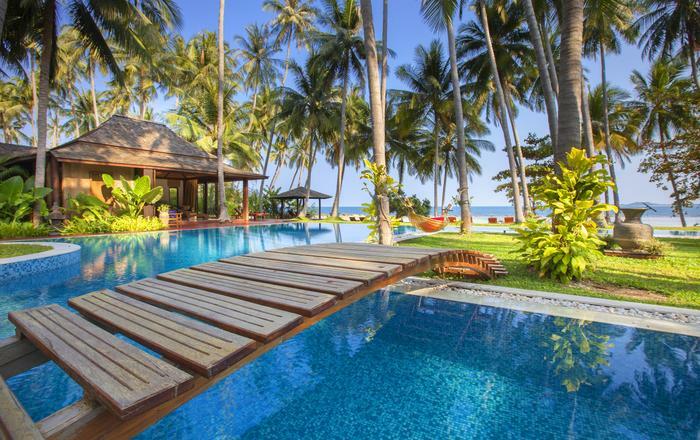 Ban Haad Sai consists of two large living pavilions situated side-by-side in a large garden that unfolds directly onto the beautiful white sand beach. Each pavilion has over 330 square meters of living space, deck and courtyard area. There is a large living room adorned in wood and cream furnishings creating a natural and welcoming space, it is equipped with all the mod-cons including satellite TV and a music system. Tall sliding doors from all of the living areas and main bedrooms open onto large teakwood decks, ideal for dining or simply relaxing with a good book. 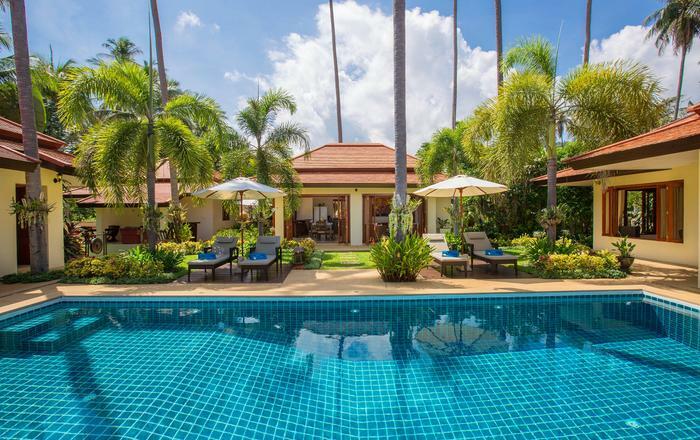 The pavilions share a 1,600 square meter walled garden complete with Thai artefacts and a large double hammock in what can only be described as picture postcard scenery! Surrounded with lush vegetation and mature coconut and tropical trees, the setting is beautiful whilst preserving everyone's privacy. Each pavilion has its own private access and a fully fitted kitchen with all the modern amenities. The indoor living areas each include a fully equipped dining rooms and the outdoor decking provides the perfect setting for an alfresco meal with a jaw-dropping view. A full time chef is included in the daily rate and so you need not worry about meal times: our chef is skilled in a range of cuisines and you can create your own menus. 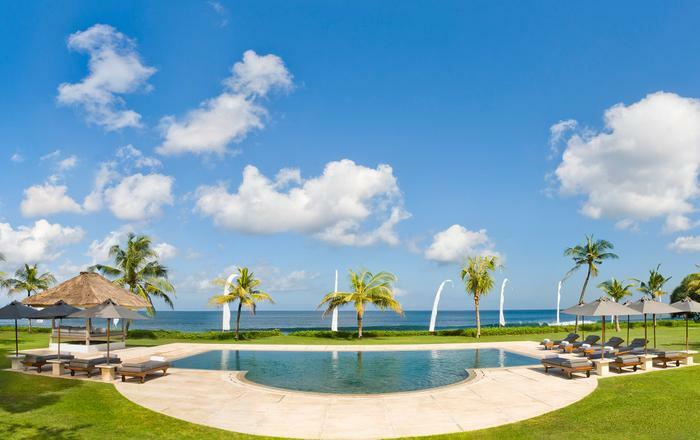 The crowning feature of this villa is 12 meter floodlit swimming pool complete with sunbathing area. All outdoor seated areas are equipped with deck furniture and umbrellas and there are pool-side sun loungers. What more it's all situated by the beach with Koh Phanghan and Big Buddha on the skyline! Each pavilion features three air-conditioned bedrooms (2 double and 1 twin) all with en-suite bathrooms. All rooms are lovingly furnished with an artistic eye and equipped to a very high standard. 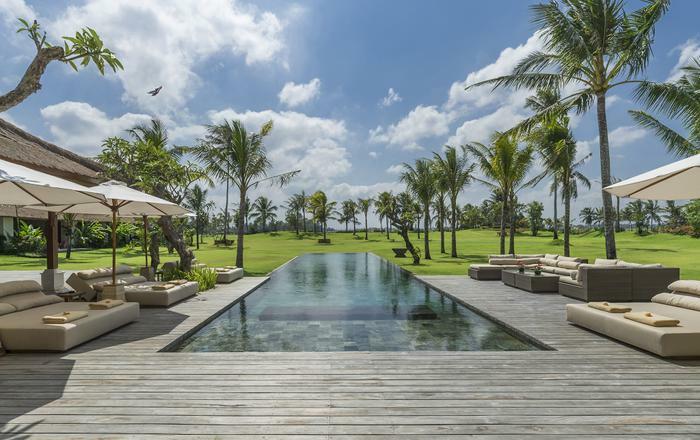 The master bedrooms overlook the beach and have luxuriant bathrooms with a secluded outdoor Balinese bath and shower for a truly opulent bathing experience. 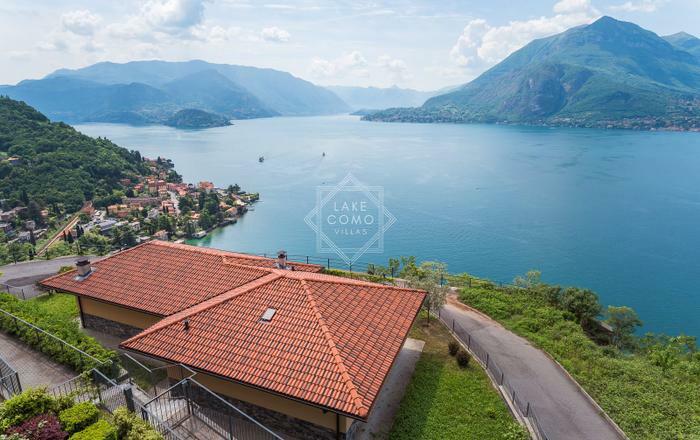 There is a third building near the entrance of the property that houses the seventh bedroom, an extra bathroom with a bath and shower and a very well equipped gym. 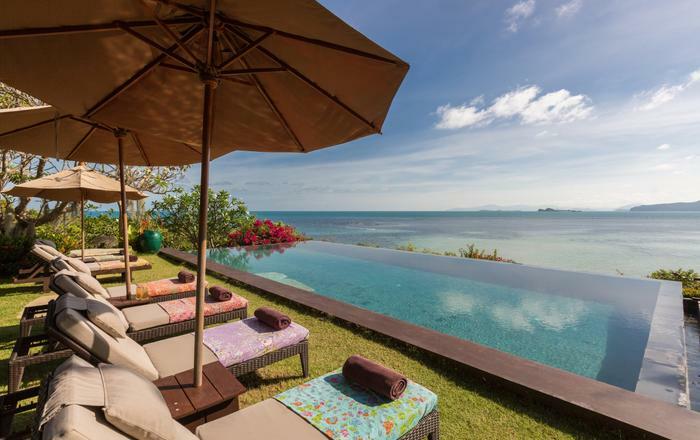 Located on Big Buddha beach on the northern coast of Koh Samui the villa is a mere 5 minutes’ drive from the airport (although not under the flight path allowing it to remain tranquil) and 10 minutes to Chaweng. The property fronts directly onto a 3km white sand beach in a bay that is perfect for year round swimming, jogging and stunning sunsets.